Dungannon Swifts boss Rodney McAree has backed his players to bounce back from Saturday’s opening Premiership defeat. The Swifts started the new season with a narrow 1-0 defeat to Glentoran at The Oval. Ciaran Caldwell’s 73rd-minute goal separated the sides following a disjointed clash on Mersey Street. 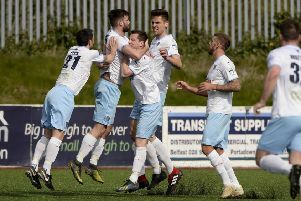 McAree is hoping his Swifts can get their season on track with victory over newly-promoted Ards on Wednesday night, but insists he is under no illusions how tough a test lies in wait at Stangmore Park. “Ards will look at Wednesday’s game as an opportunity to get at Dungannon Swifts,” McAree said. “They will certainly fancy their chances after picking up a good point against Cliftonville on Saturday. “So we know how tough it will be, but it is one that we will approach in a positive fashion and try and kick-start our season. “I was reasonably happy with Saturday’s display against Glentoran, and there are things we can build on. Last season Dungannon picked up just eight points from their opening 13 games – a woeful return that McAree hopes to avoid this term. “We don’t want a repeat of last season’s start, but I think we are better equipped to avoid that kind of scenario,” the Swifts boss added. “We lost our opening game last season against Carrick at Stangmore Park, and we were absolutely abysmal.